Multibillions of years likewise are required by the big bang theory. However, this assumption of unlimited time is strongly challenged by recent creation research. From 1997 to 2005 a team of creation scientists explored the centerpiece of geologic time—radioisotope dating. This technique, developed over the last century, is used to date thousands of rocks, fossils and artifacts. The creation research project was given the acronym RATE, which stands for Radioisotopes and the Age of The Earth. Rock and mineral samples were collected from around the world and then dated by top laboratories. The RATE results conflict with geologic time and instead support a recent creation. Carbon-14 (14C) is by far the most familiar radioisotope dating method. There is a common misconception that 14C supports an ancient age for the earth. This is not the case, however, because 14C has a short half-life compared with other dating isotopes—“just” 5,730 years. Carbon-14 is limited to dating objects thousands of years old, but not millions or billions of years. For samples that are truly ancient, any initial 14C content should have completely decayed away. And here arises a major challenge to a long timescale: in recent years, carbon-14 atoms have been found in samples of rocks, fossils, coal, and oil, which are thought to be very old. The RATE research team explored this anomaly with new measurements of 14C in ten distinct coal samples. These coals are traditionally dated at 34–311 million years old. With utmost care to avoid contamination, traces of carbon-14 were found in all ten samples. The pervasive presence of Carbon-14 in earth materials supports biblical creation. The RATE team next sought a more extreme challenge to age assumptions. Twelve diamond samples were obtained and prepared for 14C analysis. Such measurements had not been previously reported because diamonds are assumed to be at least a billion years old and therefore entirely free of 14C. Similar to the coal results, however, carbon-14 atoms were found in every diamond tested. The conclusion is clear: carbon-14 atoms in coal, diamonds, and a host of other materials provide strong evidence for a limited earth age of just thousands of years. The pervasive presence of carbon-14 in earth materials supports biblical creation. Just as carbon-14 is found where it was not expected, similar results also occur for helium in granite. When granite rock forms underground from cooling magma, it locks in traces of radioactive elements, mainly uranium-238. This uranium decays through a series of steps and eventually becomes lead, Pb-206 (Figure 1). The half-life for U-238 is measured today at 4.47 billion years. Figure 1: Zircon crystals occur inside granite. 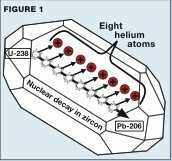 Uranium atoms within the zircons decay to helium and lead. Figures are taken from L. Vardiman, A. Snelling, and E. Chaffine, (Eds. ), Radioisotopes and the Age of the Earth, Vol. 2, Institute for Creation Research and Creation Research Society, 2005. Along the path of uranium decay, eight alpha particles also are emitted. Many of these alpha particles capture an electron and become helium atoms. The uranium and resulting helium actually reside inside tiny crystals called zircons within the granite rock. These zircons are typically 50–75 microns, which is about the thickness of this page (Figure 2). If a sample of granite is truly millions of years old, then most of the helium resulting from uranium decay should have escaped long ago from the rock. This follows because helium atoms are relatively small and mobile, and they do not combine with other elements. Recall how a helium balloon gradually loses its helium content and sinks to the floor. Figure 2: Dust-size zircon crystals extracted from granite rock are shown under polarized light. Photo by creation scientist Robert V. Gentry. Some years ago large amounts of helium were found still existing in “ancient” granite samples. The RATE team expanded this unexpected discovery. Granite rock samples were obtained from a mile underground—the product of a government drilling project in New Mexico. This particular granite formation is dated at 1.5 billion years old. Zircon crystals were painstakingly separated from the rock after crushing. State-of-the-art instruments were then used to measure the helium content and also the ability of helium atoms to diffuse outward from the zircons. The results are shown in Figure 4. The vertical axis measures diffusion, the ease with which helium atoms exit the zircon crystals. The horizontal axis shows increasing temperature of the zircons as they were heated in the laboratory. The black circles show the actual RATE measurements of helium diffusion. 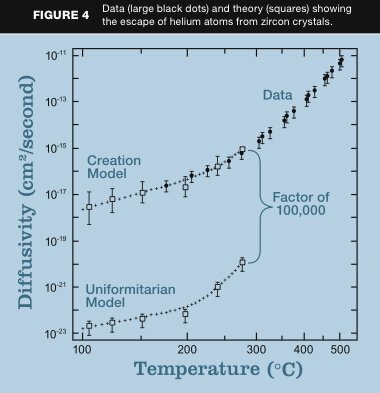 This data trends upward because heat increases the movement of helium atoms. The upper squares are the calculated diffusion values, based on the amount of helium found in granite rocks, and an assumed timescale of 6,000 years. In contrast, the lower squares show the much smaller diffusion values required for the helium to be retained in the zircon crystals for a billion years. Clearly the creation model gives a much closer fit to the measured diffusion data. The long-age assumption is in conflict with the experimental diffusion data by a factor of at least 100,000. 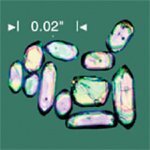 These RATE studies indicate that helium atoms can only be retained in zircon crystals within granite for a few thousand years. Yet helium atoms are found in abundance inside granite zircons. The presence of this helium within granite points directly to a young Earth. Figure 3: A radiohalo burn due to radiation damage within a crystal. 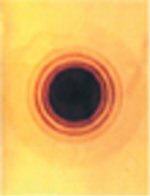 The inner black circle is 70 microns across, about the thickness of a sheet of paper. Radioactive decay, which occurs within crystalline rocks, may leave a permanent record in the form of radiohalos, or halos for short. These are tiny spherical regions of damage or “burns” in the crystal structure (Figure 3). The RATE team conducted a survey of halos in more than 100 granite rock samples collected from Finland, Australia and six western states. More than 40,000 halos were cataloged, and a fascinating trend became evident: most of the halos reside in granite rock which intrudes layers of Paleozoic and Mesozoic strata. RATE scientists believe that these sedimentary rock layers formed rapidly during the Genesis Flood. Upward-moving magma from tectonic activity intruded the layers and then cooled to become granite. The numerous radiohalos in this granite indicate that large-scale radioactivity accompanied the Flood event. This implies that radioactive decay was greatly accelerated during the year-long Flood. The concept of accelerated nuclear decay was further explored by the RATE team. This is a radical idea because nuclear half-lives are assumed to be constant throughout history. If nuclear lifetimes indeed varied in the past, then traditional radioisotope dating is fatally flawed. It is as if the world’s clocks temporarily ran faster in the past, which makes their present readings unreliable. The mechanism of accelerated decay may have included temporary changes in the fundamental constants of nature. Further study is needed, including the Creator’s possible reasons for modifying radioactivity. Accelerated nuclear decay is one of several creation predictions that challenge the most basic assumptions of secular science. 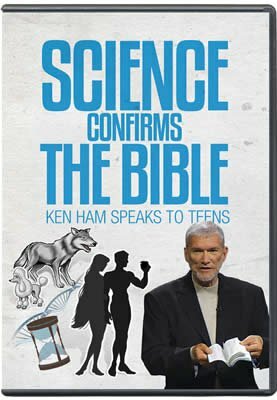 Similar predictions include evidence for ex nihilo creation, a young age for the earth, alteration of nature at the time of the Curse, the global Flood and the rapid formation of the earth’s sedimentary rocks and fossil record. This reappraisal of earth history opens entirely new horizons for inquiry, research, and data interpretation. RATE research further explored such topics as fission tracks, isochrons, nuclear theory and biblical data. Without exception the results give significant support for the young-earth model of earth history. The multi-year effort clearly has raised the bar on the quality and depth of creation research. RATE members include: Steve Austin, John Baumgardner, Steve Boyd, Gene Chaffin, Don DeYoung, Russ Humphreys, Andrew Snelling, and Larry Vardiman. 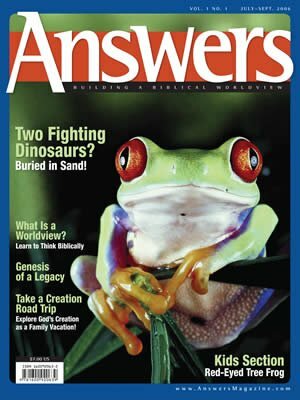 Previous Article The Intelligent Design Movement Next Article The World: Born in 4004 BC?